Coco’s Special Cheese Dressing | What about this? Feeling very proud of the heads of lettuce growing in two small planters in my backyard, I announced to my husband that we were having a very fresh salad for dinner. With lettuce that fresh, I wanted to serve it with a good homemade salad dressing instead of a bottled dressing. Coincidentally, earlier in the day, while flipping through the pages of a book, I found a newspaper clipping containing a recipe for a requested salad dressing from the Coco’s restaurant chain. Finding the recipe and having all the ingredients on hand, I felt destined to make it. Sometimes the moon and the stars align and everything works out perfectly! 1. Combine milk, mayonnaise, sour cream, and buttermilk. Whisk until blended. 2. Place vinegar in cup and stir in garlic salt and pepper. 3. Add to mayonnaise mixture and blend in cheese. 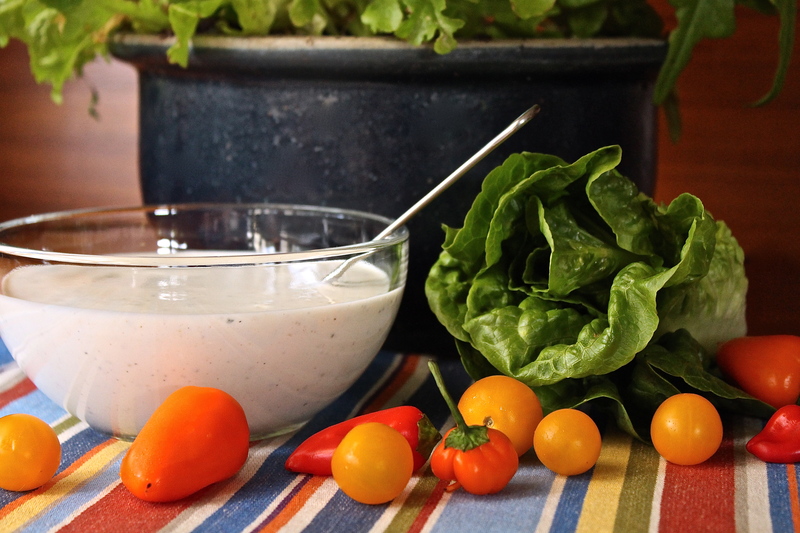 To keep this salad dressing on the healthier side, I substituted Greek yogurt for the sour cream.